Photo courtesy of Rick Vaughn. Book found in Cheonan, South Korea. Can we fix it? YES, I am! also, u got that from family guy! teacher: John use aren’t we in a sentence. Considering my horrid spanish, that’s probably as badly (if not worsely) translated. Can’t you speak English ? Sim eu sou. Szopjatok le a faszomat !!! Is the girl answering her own question? See nothing to worry about Chinese now have good tools for English now right yes thank you drive through. My spanish is as questionable as those kid’s english is. Boy: Can’t you speak English? Boy: Well, that answers my question. Girl: I am not understand!! Oops! I got the boy and girl mixed up. Am I sorry? Yes! I can!! @ Poopskin: Â¿No puedes hablar inglÃ©s? Â¡Si! Â¡Â¡Yo soy!! I will take that as a “no”. Are you a monkey? Yes, she is. Are you a vegetarian? No, No, I’m a Korean. In fact, I am speak English fluently! 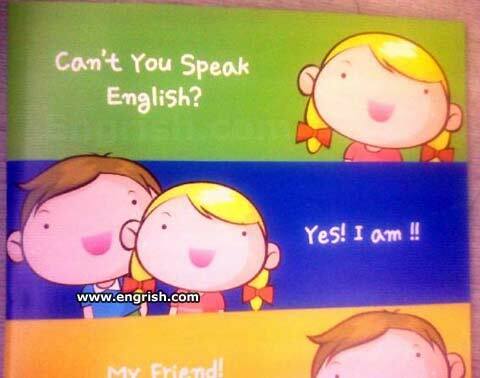 Are you can’t you speak english? yes and I so too can! yes I so and can! My friend! You have brain damage! I can’t speak english!? yes i am! my firend!! oh i can speak english very nicely and very deliciously. Yes I am very Engrish mastery, my speaking is the perfect of the language of Engrish! – But me dont put sock on iceream of mine! No, but I can spell the English with an “R”. I don’t have a mouth but i want to speak. – I am English. I learn it from a book. – Can’t you speak English?